Audiometry is a test that measures how well you can hear. An audiologist performs this test. An audiologist is a person trained to identify and help manage hearing problems. This test is done to detect or monitor hearing loss. There are no major complications associated with this procedure. This test usually takes place in a soundproof booth. You will put on headphones that are connected to an audiometer. This device sends sounds of different volumes and pitches to 1 ear at a time. You will be asked to respond each time you hear a sound. You may be asked to respond by raising your hand. You may also be asked to wear a special instrument called a bone oscillator. It is worn behind each ear. The device sends sounds as vibrations directly to the inner ear. You will again be asked to respond each time you hear a sound. You will wear special headphones. You will hear simple, 2-syllable words. Words will be sent to 1 ear at a time at different volume levels. You will be asked to repeat each word or point to a picture. A probe is inserted into your ear. The device changes the air pressure in your ear and emits sounds. The test measures how much your eardrum moves in response to the air pressure change and the sounds. 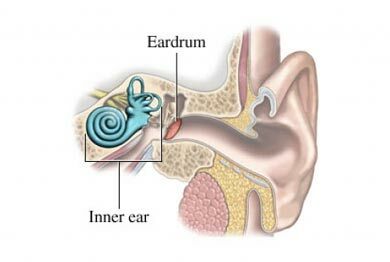 It can help determine how well the middle ear is functioning and if there is fluid in it. Babies are watched to see how they react to certain sounds. Children are taught to look toward the source of a sound. Older children are given a fun version of the pure tone audiometry test. Sounds of varying volume and pitch are sent through headphones to one ear at a time. Children are asked to do something with a toy each time they hear a sound. They may be asked to drop a block in a bucket. Newborns and young infants may have brain stem auditory response testing. A sound is sent through headphones to one ear at a time. The response is measured using electroencephalogram (EEG) recordings over the auditory cortex. Your test results are recorded on an audiogram. This is a chart or graph that shows the softest sounds you can hear. The audiologist will explain your test results. Testing times vary. A first screening may take only 5-10 minutes. A more detailed hearing test may take up to an hour. There is no pain associated with these tests. Your doctor will talk to you about treatment options if your test results confirm that you have hearing loss. Brender E, Burke A. Audiometry. JAMA. 2006;295(4):460. Hearing assistive technology. American Speech-Language-Hearing Association website. Available at: https://www.asha.org/public/hearing/treatment/assist%5Ftech.htm. Accessed August 24, 2018. Hearing screening and testing. American Speech-Language-Hearing Association website. Available at: https://www.asha.org/public/hearing/testing/assess.htm. Accessed August 24, 2018. Types of hearing tests. Cincinnati Children’s website. Available at: https://www.cincinnatichildrens.org/health/h/hearing-tests. Updated April 2016. Accessed August 24, 2018. What is an audiogram? Baby Hearing—Boys Town National Research Hospital website. Available at: https://www.babyhearing.org/what-is-an-audiogram. Accessed August 24, 2018.